Thirteen of the Articles headed to Annual Town Meeting in March are the result of Citizen Petitions. Sponsors were invited to present their cases to selectmen and the Advisory Committee last week before they vote on petitions. Only two sponsors did – but one of them was responsible for most of the petition articles. Today, I’m going to focus on just those articles spearheaded by Karen Hanlon Shimkus. * The resident’s petitions revolve around 4 topics split into 10 Articles for specific bylaw changes. In Hanlon Shimkus’ presentation last week, she referred to most of her proposed changes as putting the Town “on parity” with other Towns in the state. The resident called many of her language/policies “standard” and “common practice”. Some she said were for clarity for residents or officials on processes or acceptable standards. But one set of changes is intended to provide “balance” by putting more power in voter’s hands. That is a move to have residents directly elect Advisory Committee officers. Selectmen opted to hold off on taking Article positions last week. But they did pose a few questions and make a couple of comments. Below, I’ve summed up the Articles and highlights from the discussion. Numbering of the Articles in the draft Warrant has been in flux. That caused some confusion during last week’s presentation. Since those may change again, I won’t be using them below. For now, I will just group them by theme. 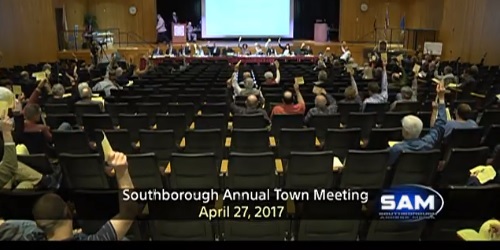 The Article would rescind language that was adopted by Town Meeting voters in 2017. Current bylaw prohibits candidates or their agents from standing within 150 feet of the entrance to Town Meeting for the purpose of electioneering or greeting citizens or voters, or for petitioning or soliciting signatures for any purpose. Hanlon Shimkus referred to current law as prohibiting the handing out of voter materials at Town Meetings. She cited the Secretary of the Commonwealth’s office as saying no other Town is known to have such laws. Answering a question from Chair Lisa Braccio about the fact that the display is already standard practice, Hanlon Shimkus explained that it is to make the practice clear to voters. She said that many voters have entered the hall empty handed since the tables were around the corner from check in. Hanlon Shimkus responded to one concern stated by Braccio – her research showed that it is legally acceptable practice to have a board that is partially elected and partially appointed. Braccio also opined that sometimes on a board “things work out” as to who is interested and should be Chair and some committees change every year. Hanlon Shimkus rebutted that if someone wants to be Chair, they can run for it. She called the Advisory officers “some of the most important positions in Town government”. She said the change would give voters some direct say in who oversees finance and provides some balance. Advisory’s only comment last week was an clarification by Chair Kathy Cook for the public about the officers. She said the committee adopted the practice of electing a Vice Chair a few years ago but that the position isn’t currently outlined in the bylaws. Replace Town Code language on the annual appointment of Town Counsel and responsibilities. The appointment would now include language that selectmen are free to remove counsel at their “pleasure”. The responsibilities list is much longer and more detailed than the current text. Hanlon Shimkus said it would put the Town on par with other Towns and provide clarity to residents. Answering a question from the board, she said the Article was unrelated to a failed past effort by Sam Stivers. Stivers was in attendance and confirmed that the Article didn’t cover the same topic. If the previous Article is adopted, it would replace language that included that the Town may employ additional Special Counsel. This new section would patch that hole and add clear language about hiring authority for additional counsel. A new “Prohibited Conduct Policy” to be added for employees and agents of the Town and the Schools. Hanlon Shimkus said that it is intended to “safeguard” the assets of the Town and business done on behalf of the Town. She said it’s self explanatory and basic and will allow for greater transparency. The long detailed text includes allowing for removal of committee/board members who violate the policy. The proponent answered that she hadn’t brought the proposal to the School Committee for their feedback but would do that. *The proponent submitted Citizen Petitions under the name Karen Hanlon. In previous public meetings, she has referred to herself as Karen Shimkus. To avoid confusion, I’m using both of her last names here – as I have also seen her listed as “Karen Hanlon Shimkus” in some documents.